Each of the 3 panels measures 10? 12? NEW sturdy archival paper box - no more plastic! 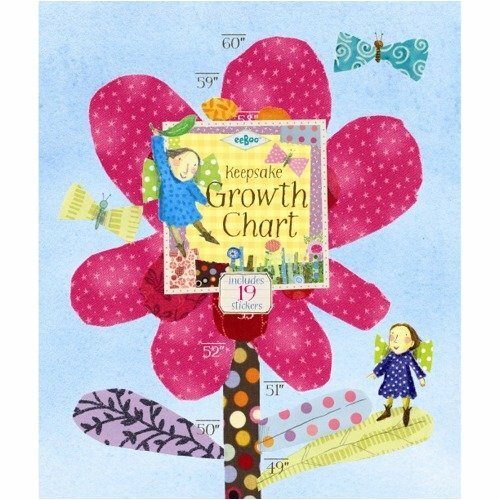 eeBoo Hot Pink Flower Growth Chart The beautiful eeBoo Hot Pink Flower Growth Chart will help you keep track of your kidGCOs growth. It's colorful and attractive and provides a convenient way to mark important details in your child's growth. The chart is laminated and is made of 90 percent recycled materials. It folds up compactly and can be stored neatly inside the sturdy paper box. Why YouGCOll Love It: The adorable chart includes lots of lovely stickers to mark special occasions. Features Laminated foldable chart Grosgrain ribbon to hang the chart Sturdy paper box Contains no plastic Measures kids up to 60 inches Includes: Stickers"